The type of training I do is often called “clicker training.” That makes it sound like the clicker is a really important part of the training, and in many ways it is. The clicker is a little plastic and metal noisemaker that, in clicker training, is used as an event marker. An event marker is a distinct signal that lets the dog understand precisely what behavior has just caused a good thing to happen—in other words, why he got that treat, or why you put the food bowl down, opened the door, or threw the ball when you did. You want to make sure you are clearly identifying the behavior that you’re reinforcing, because behavior that is reinforced will increase. Using an event marker to select behaviors you like, you can “capture” things your dog actually already knows how to do—sit, lie down, stand, walk, turn, bow and stretch, even stick out his tongue—and then teach him cues, or signals that mean “reinforcement for that one is available now.” This method can quickly result in a prompt, happy response with no need to show the dog a treat first or fade out temporary, exaggerated cues (like bending all the way to the floor to get a “down”). Reinforcement needs to immediately follow a behavior to be associated with it, but any signal that routinely predicts reinforcement becomes reinforcing in itself (think of the digital notification that your direct deposit has posted). So once a dog learns what the event marker means, the event marker starts the reinforcement process. That means it can buy the trainer time to deliver the main prize, even if she’s across a room. It can also reinforce behavior on its own, though an event marker will remain strongest and most useful if it predicts stronger stuff. If you’re not using a clicker or another predetermined marker, there will still be something that starts the process—e.g., reaching toward your pocket if you’re using treats. If you’re not aware of that, you may end up reinforcing something other than what you thought. Learning to use a marker consciously can help the human avoid these problems, which are often wrongly blamed on the dog. In the experience of many trainers, myself included, the clicker is one of the clearest and most effective markers used for dogs. It starts out neutral, sounds the same every time, and (ideally) always predicts something the dog wants. In graduate research by Lindsay Wood, a trainer and associate certified applied animal behaviorist, properly using a clicker decreased the time and repetitions needed to learn a new behavior by a third (PDF) versus using a verbal. But what if your dog is deaf, or shirks at the sound of the clicker? Can you still do this type of training? This is the question Rover-Time’s staff brought to me for this month’s column. The clicker works well in part because it generally starts out neutral—the dog hasn’t heard it before, and it has no particular associations, so it’s easy to build good ones. But sometimes that’s not the case. The clicker or a noise like it may have predicted something the dog found aversive in the past, or the dog may be unusually sensitive to new sounds. Or, as they’re sold without instructions, the clicker may have been clicked at the dog in a mistaken attempt to punish or interrupt behavior, and the dog may have learned to either dislike it or tune it out. In these cases, there are infinite solutions. All you need is a signal that’s easy for you to give with good timing and easy for the dog to perceive. Some trainers have used ballpoint pens or Snapple lids for a quieter click. Horse clicker trainers, whose hands are often busy, make a single click with their tongue. Some trainers use a short, sharp word, including forms of “yes” the dog hears less often, such as “yip.” Dolphin trainers, and some dog trainers, use a whistle. In the Give Them Love protocol, which I wrote about here, grad students at University of North Texas experimented with using extended, calm petting to systematically train shelter dogs not to jump. Their “click,” the marker predicting this type of petting, was a ritualized hand gesture that evolved out of the movement to reach down and pet the dog. 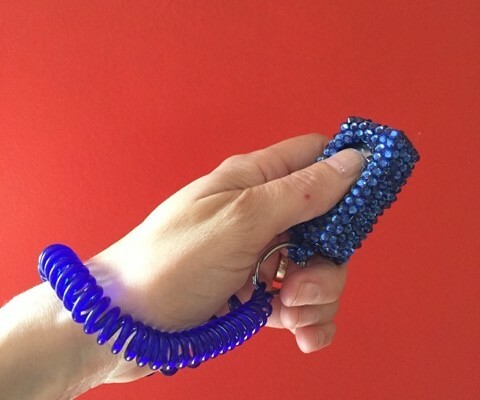 For deaf dogs, options include a special hand signal, a vibrating remote collar (sans shock), and the ingenious Flicker, a visual clicker for deaf dogs made of what appears to be a keychain flashlight and a ping-pong ball (inventor Jamie Popper, a trainer in Florida, sells them on Etsy). So the clicker isn’t the most important part of clicker training, and your dog’s inability to perceive or tolerate a click doesn’t mean you can’t train this way. Even when behaviors are trained initially with a clicker, the click is usually faded in favor of less precise markers once the behavior is known. What remains essential forever, though, is the system of communication, which involves saying thank you promptly and in a way that is meaningful to your individual dog. Learn more about or contact Kiki Yablon at Dog Training by Kiki Yablon. Blingy clicker by Shannon Thier, CPDT-KA, on Etsy as The Pongo and Tonka Show. Done! Thanks, Shannon! Let me know if there are better links besides the ones included.